BAGHDAD (Reuters) - Iraq, torn apart by years of war and sanctions, remains so rich in hidden ancient wonders that a leading expert believes the world's archaeology books will have to be rewritten over the next decade. As security improves to allow excavation, evidence may emerge that advanced societies existed in the area much earlier than previously thought, said Dr John Russell, professor of archaeology at the Massachusetts College of Art in Boston. "A decade of research in Iraq could rewrite the books of archaeology, no question," Russell, who is currently serving as a senior adviser to Iraq's ministry of culture, told Reuters on Thursday at the opening of new conservation and restoration laboratory at Iraq's National Museum in Baghdad. "There is just a phenomenal amount of history in this country and much of it is yet to be discovered. But over time it will be and we'll have to totally rethink what we know." In 1989 and 1990, Russell led excavations at the site of Nineveh, the ancient capital of the Assyrian empire, which lies on the Tigris river in northern Iraq, near modern-day Mosul. In each year, he said, his team made discoveries that essentially pushed back the timeline for ancient civilization by a millennium. "It was just absolutely incredible, they were unprecedented discoveries. But Iraq is like that," he said. Often referred to as the cradle of civilization, Iraq's modern-day boundaries encompass ancient Mesopotamia, the area between the Euphrates and Tigris rivers, which was the foundation for the world's earliest societies. Over the centuries, hugely important discoveries have been made in the area, from the Sumerian city of Ur in southern Iraq with its massive ziggurat, to ancient Babylon south of Baghdad. Beyond those widely known sites, there are scores of other, lesser known settlements that are steadily being excavated and perhaps dozens more that have yet to be discovered. But the big hurdle is security. Almost a year after Saddam Hussein was overthrown, many areas remain unsafe and armed looters are a common enemy, particularly at remote sites. In April last year, days after Saddam's fall, looters struck another terrible blow against Iraq's ancient heritage, stealing scores of priceless artifacts from the National Museum, many of which have yet to be recovered. Some 5,000 cylinder seals, small cylindrical stones carved with decorative designs and used to identify tablets and ceramics, were stolen, along with the so-called Sumerian Mona Lisa, a 5,000-year-old alabaster sculpture of a woman's face. That mask and some 1,000 of the seals have been recovered, but Russell, who is helping to oversee the restoration of the museum, says about 20 "unique, world-class pieces" are still missing, along with an estimated 10,000 smaller works. Some of the pieces were smuggled out of Iraq, and investigators are working through the courts to try to recover items taken to Switzerland, the United States and Britain. But Russell believes most of the outstanding artifacts are still in Iraq, and says the recovery rate for those stolen, at around 25 percent, is far better than it might have been. He hopes the museum, which has been extensively renovated, will re-open in the next couple of months if security permits, allowing many of Iraq's greatest treasures to be on show again. "This is one of the great museums of the world," he said. "In time, we hope to turn it into a truly viable academic research institute that draws art historians and archaeologists from all over the world." IMO, the next 'big' discoveries will be made underwater off the coast of India and in South America. "Expert Says Iraq Could Rewrite Archaeology Books"
Let's see them write their damn constitution first. Does this strike any of you as a quote from someone trolling for a grant? I mean, yeah, sure, evidence may emerge---or it may turn up a bunch of pottery shards and crude tools that impress nobody. This rings of hyperbole and rings totally hollow, in view of the fact that in spite of over 100 years of academics' presence in Iraq, the "treasures" cited as being lost to looters were not adequately catalogued and photographed. Even as a non-archeologist, I would have better sense than to allow that to happen! Film is cheap, and the lapse is inexcuseable incompetence. I still believe that the true cradle of civilization is in Egypt and the Nile. New evidence indicates writing began there and not a Sumer as was once thought. There is more in the ground than has ever been dug up--even after all these years. Yes, and it also strikes me that these same types will stand in the way of anyone still looking for WMD for fear they'll crush the world's oldest blister-buster or similar priceless objects. Just what the troops need in Iraq... another bunch to babysit. BTW, weren't all of Iraq's treasures in those museums that were destroyed while we stood idly by? "New evidence indicates writing began there and not a Sumer as was once thought. " I read something recently (can't remember where) that pointed to the Balkan area as having the first writing. it may turn up a bunch of pottery shards and crude tools that impress nobody. I'm amazed at how many people get fascinated with pottery shards and crude tools. I used to have a girlfriend that was into all that, got excited about going on digs and such. To me, it was just a bunch of rocks. I suppose that someday, someone will find my corn flakes bowl and gaze upon it with wonder. The most interesting finds out of Iraq I've seen lately are the Warka Mask (the "Sumerian Mona Lisa" mentioned in the article) and the magnetic mapping of Uruk that turned up a previously-unknown canal system and led to the discovery of the Tomb of Gilgamesh. I believe the latter excavation had been held up during the last few years of Saddam's regime, so I'll be anxious to see what else turns up now that excavation can resume in earnest there and at other sites. I think it will be in the Black Sea. The valley was perfectly placed to have been 'The Cradle of Civilization' and anything in it is protected by the dead or sterile zone below 400 feet. Besides the ancient center of civilization, there should be thousands of completely preserved ships from every age. Is the attached what you're trying to remember? One note I'd add to the general discussion: there are qualitatively different types of "writing", ranging from the prehistoric symbolic "shorthand" identified by Marija Gimbutas (where each character is a stylized symbolic picture, for instance a zigzag might represent water and associated concepts) to full-fledged alphabets (writing where each character represents a syllable rather than a picture, word, or idea), so the identification of one culture's writing as "first" depends partly on how we're defining "writing". It is known that there were certain types of written symbolism before the Sumerians, like cave art for instance. The usual identification of Sumerian writing as "first" refers only to the Sumerians' development of "logo-syllabic" writing: writing where each character represents a word with a literal or symbolic referent. Similarly the identification of a civilization as "first" depends on what definition of "civilization" is being used, whether we're talking about seasonal dwellings like some American Indian tribes used, permanent villages, agriculturally-based cities, or what. The Sumerians are usually considered first with reference to the level of sophistication they achieved in their irrigation techniques and how that translated into their ability to support large cities centered around temples and other specialized buildings. However this does not necessarily imply they were first in all respects--for instance walls are found in non-Sumerian cities like Jericho before they are found in Sumerian cities. Anyway, stuff on early writing attached. 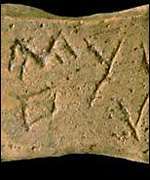 The potsherd of 5500-6000 BC, found at the islet Yura of Northern Sporades bearing Greek alphabet letters. The facsimile to the classic Greek letters Alpha, Ypsilon and Delta can be recognized. This find proves that the classic Greek alphabet is older than the Greek linear alphabets. It also demolishes crushingly and definitely the false theory that Greeks took the alphabet from the Phoenicians, who emerged in history around 1150 BC, i.e. 4500-5000 years after the creation of the Yura written potsherd. After the discovery of a wooden plate at Dispilion Kastorias, which was dated at 5300 BC, a new impressive discovery came to light, concerning the "prehistorical" alphabet in the Greek region. In the "Cyclop cave" at the desert islet Yura of Northern Sporades (20 miles out of Alonissos), ceramic fragments of written pots (potsherds) were excavated, upon the surface of which have been carved symbols facsimile with the letters of the classic Greek alphabet. The potsherds are dated between 6000 and 5500 BC. The discovery at the cave in question, is conducted by the archaeologist Adamantios Sampson since 1992 and according to him: "besides the ceramics of the Later Neolithic, we have discovered written potsherds of exceptional quality dated at the end of Early Neolithic and at the beginning of Middle Neolithic. The aceramic layer was dated between 6445 and 6375 BC with the radioactive carbon method, while the layers of the Middle and Early Neolithic (among which are the potsherds) were dated between 6025 and 5955 BC" (A.Sampson, "The Greek Neolithical Civilization", Goulandris Foundation, 1996). In the above study A.Sampson makes no other menthion of the tremendously imprortant discovered Yura potsherds, but confines himself to the description of the fishing activities at the Sporades area during the Neolithic era. The reference material, which he mentions, includes photographs of other finds (fish-hooks, statuettes, decorated pots) from the excavation in question, but not one of the written potsherds. The photograph of one of the written potsherds came out from the newspaper "Adesmeftos Tipos" (presentation of N.Nikitidis 13 February 1997) in a relevant publication under the title "The most ancient alphabet is Greek". On the surface of the potsherd the letters Alpha, Ypsilon, Delta in a row are clearly distinguished, which make up the root of the word "ÁÕÄÇ" (speech, voice), first encountered in "Theogony" (Hesiodus) as well as in "Iliad" (Homer). In the same publication A.Sampson is reported to confirm that "they are alphabet symbols and make up a conscious act of the ceramist" and reserves his total evaluation of the finds for a future scientific paper. It must be noted that only a small part of the cave in question, has so far been excavated, thus, in the immediate future probably, the rest written potsherds will be discovered. When this will happen, it will be possible to make a total evaluation of this ancient alphabet type, which doesn't seem to be different from the classic and modern type. These tremendously important finds justify the historic and linguistic view of the simultaneous creation and evolution of the Greek language and Greek alphabet and render beneath significance and importance the Phoenician theory for the History of Civilization. During the Mycenaean period (1600-1200 B.C.) there was writing in use in Greece, what is now known as Linear B, and no sign of the later alphabet. Gioura or Yioura is a small island near Alonnisos or Halonnesus...one of the speeches in the collection of Demosthenes' speeches (Oration VII, probably not by Demosthenes himself) is about Halonnesus. "I think it will be in the Black Sea." "The valley was perfectly placed to have been 'The Cradle of Civilization' and anything in it is protected by the dead or sterile zone below 400 feet." "I wonder if the time capsul I buried in 1956 in upstate New York has been discovered yet..."
Don't know but, let me know if you see any of the bottles I threw into the Pacific, the Atlantic, the North Sea, the Indian Ocean and the Mediterranean in the early and mid-'60's. I haven't heard a peep yet. "Nineveh" is mentioned in the Bible. I hope they DO get to excavate more. Thank you for posting this. "Is the attached what you're trying to remember?"